If you’re suffering from losing your balance as you’re swinging you’ll know how detrimental this can be to your ball striking. 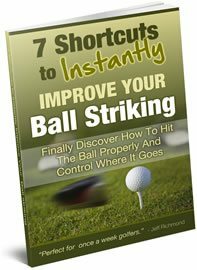 So that’s why in this article I’m going to give you a simple golf drill to help you fix your golf swing balance problem, fast. Ok, let’s get started. 1st. Stand up straight. Position your feet about shoulder width apart. 2nd. Let the straightness out of your knees so they have a slight bend to them. 3rd. Position a driver along your spine. 4th. Bend forward slightly while making sure that your spine remains straight. Having the golf club on your spine will help you to feel this. When you do this it’s important that you feel as though your backside is moving back like you are going to sit on a chair. Doing this creates a balanced posture position. Also, it’s important that your weight is positioned on the balls of your feet, not the heels or the toes. 5th. Move your left hip slightly towards your target by about 2 inches. This helps to place your head behind the ball so you can put all your power behind the shot for longer golf drives. 6th. Get the driver from your spine and setup with it as though you are about to hit a golf ball. You may have to either bend over more or stand up straighter to get into a comfortable setup for your driver. Now to tell if you are in a good balanced posture position I want you to get someone to lightly push on both shoulders from behind and in front. You’ll find when you get someone to do this that it will force you to anchor yourself to the ground and balance yourself so you are not easily pushed over. When you find your balanced setup position you’ll discover that when someone gives you a slight push you will be steady and solid. So to fix your balance problems in your golf swing, do this setup exercise and get someone to test you to make sure you’re in a balanced setup posture position. 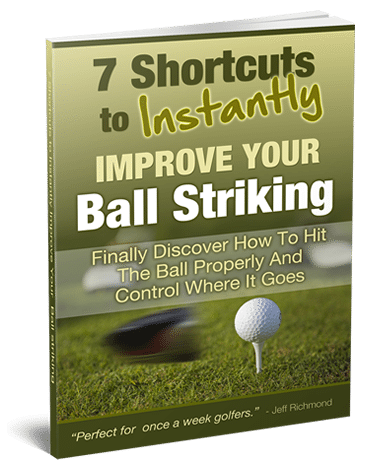 You’ll find when you get this mastered that you’ll hit much better and more consistent golf shots and your golf swing balance problems will be solved!